Within the Department of Communicative Disorders, faculty and students conduct research in many areas within the field. The following areas are particular foci of the faculty’s published work in recent years. Current and prospective students are encouraged to inquire about research experience in any of these areas, or others, and can learn more about recent research by students on our Research Opportunities page. Dr. Angela Barber’s primary research interests involve early identification and intervention with young children who have an autism spectrum disorder (ASD). The goal of Dr. Barber’s research on early identification is to contribute to effective surveillance and screening practices in pediatrician offices. Her intervention research focuses on peer-mediated play interventions with very young children with ASD. The goals of this intervention are to improve social initiations and motivations and to decrease repetitive play behaviors in toddlers with ASD. In addition, Dr. Barber is interested in the differences between early language profiles of children who have ASD, children who have specific language impairment, and children who are late talkers. Recently Dr. Memorie Gosa has been the principal investigator on projects involving the prevalence of feeding difficulties in children with autism; achievement of oral feeding skills in infants born prematurely; benefits of sidelying during bottle feeding for infants in NICUs; evidence-based systematic review of feeding therapy interventions for improving oral intake; and clinical application of systematic desensitization for improving variety of oral intake. Dr. Marcia Hay-McCutcheon’s research focuses on existing disparities in hearing health care for adults living in different geographical regions of Alabama. The goals of this research are to understand how hearing loss is associated with specific physical ailments, and additionally, how hearing loss might affect emotional well-being. 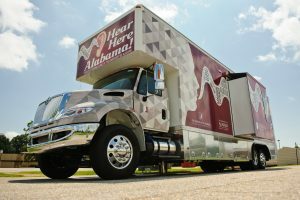 She can accomplish her goals using the Hear Here Alabama truck that she takes to rural areas just south of Tuscaloosa. Inside the truck are two sound booths and the audiological testing equipment that allows her to conduct her research. Dr. Anthony Buhr is interested in the organization of behavior from a dynamic systems perspective. Within this perspective, speech is a complex behavior in which linguistic processes and vocal tract movements are organized by communicative intentions. A communicative intention may be thought of as an idea that one wishes to convey to others, for the purpose of influencing others’ thoughts or actions. Knowledge about the topic you are trying to communicate (i.e., experience communicating the intention). What the listener (or audience) may already know about the topic (i.e., how well you know the listener). How well the listener appears to comprehend (or agree with) your communicate intention (i.e., social feedback from the listener). Whether the communicative act facilitates long-term social goals (i.e., the communicative act accurately reflects one’s social self).